I have some very exciting news: this blog has been picked up by Psychology Today so this post can be read here or on my new Out With It page over on their site! Earlier this month I spent four days at the World Congress for People Who Stutter. I couldn’t imagine a more thoughtfully run or inclusive conference. The days were a mass of hours spent hanging on people’s words. It was a week when time felt endless and a place where blocks and repetitions were not only accepted, they were normalised. The conference opened with a keynote from a fluent researcher. The next keynote came from an esteemed author who stuttered once or twice as he candidly explored a condition close to his heart, a carefully crafted speech about the beauty and difficulty of stuttering. The next couple days followed the same pattern. Multiple workshops and two powerful keynotes a day given by great, honest speakers who spoke passionately about stuttering. All of the keynotes stuttered a little but never enough to break the flow of their speech. Never enough to tie up their dexterous tongues. As I listened to their speeches I felt my knees start to shake and my mind drift down paths I didn’t want it to take. How could I compete? I knew that I couldn’t mimic their speech. And yet, despite the fact that I was at a stuttering conference and talking to an audience of stutterers from across the world, a part of me wanted to be as fluent as the other speakers. A long-forged part of my brain told me that I should do my best to wipe out as many stutters as I could. When I finally stood at the podium to give my keynote, I had spent hours writing and practicing my speech. As I put on my glasses and took in the audience I felt enormously proud to be looking out into the eyes of many of the kindest people I had ever met. Then I began to speak. It is no exaggeration to say that I stuttered on nearly every word. On the cyclical scale of my speech, my stutter was at its most profound. I pushed through syllables that spanned over long seconds. I felt the pages of my script go limp in my iron grip. I laughed when I got trapped on a ‘me’ that seemed to echo around the large conference hall endlessly. And yet all eyes in the audience stayed fixed on me as I recounted the journey I had taken to come to terms with my voice. Faces broke into smiles at whatever jokes I told. Fierce applause broke around the room as the speech reached its breathless end. At the end I felt euphoric and exposed. It is one thing to write a book about stuttering, quite another to stand up and go through the physicality of telling that story. Stuttering is not an easy thing to do. It takes away the control that we want to have over our language and our appearance. And yet, in the wake of that speech, I realised it is also an incredibly powerful thing. It has its own dynamism that we do not need to bleach out. It can connect us to people, rather than alienate them. There are times when I have found myself listening more intently to stutterers than fluent speakers, waiting eagerly for their words and deeply appreciating the window that their speech cracks into their humanity. Unfortnuately we rarely see stuttering public speakers. I hope that will change. It is well and good having role models who seemed to have curbed their stutter and eased into a more fluent way of speaking, celebrities and politicians who readily attach their names to stuttering but rarely, if ever, stumble on their words. But we need to really hear stuttering if we are going to change the conversation. We need to watch outspoken, unapologetic stutterers talking eloquently if we are ever going to rewrite the ‘fix’ narrative of our lives. All of us can own whatever speaking skills we have, however paradoxical they may be. We do not need to fit into an aggressive, motivational speaker mold – rather we can speak up with whatever voice we have. We can be proud of the unique qualities of our soft-spoken words, our quirky sense of humor or our stutters. We can believe that our voice, and our story, is worth hearing. Who is the most memorable and unique speaker you’ve ever seen? This entry was posted in connection, courage, Out With It, Public speaking, speaking, Stuttering, vulnerability by Katherine. Bookmark the permalink. Katherine… you are on a journey I started back in 2006. That’s when I, a person who stutters, started getting hired to do keynote presentations from my business book TRIBAL KNOWLEDGE. (In this book I shared lessons learned from my days as a marketing manager with Starbucks.) Since 2006, I’ve delivered somewhere around 300 presentations. They’ve gotten easier as I’ve become more comfortable on-stage. I saw Paco Underhill give a talk many years ago and that had a profound impact on my life. Paco is a retail behavioral scientist. His company studies how people shop. Paco has written two best-selling books and is an in-demand keynote speaker. Paco stutters. For some reason a conference put two stutterers on the agenda. (Imagine that.) Hearing and seeing Paco stutter on-stage, albeit slightly and masked as a nerdy nuance, made me more comfortable I could succeed as a keynote speaker. I’m able to hide much my stuttering through my eyes. I’ll blink quickly. I’ll close my eyes. I’ll quickly look off in a different direction. I’ll gaze in one spot for a few seconds. Most people in a large audience can’t really see my eyes so they don’t notice the many times I stutter. They do notice the times when my verbal blocks and vocal repetitions make it readily known that I stutter. That, I can’t hide. 1. I advertise my stutter. Unlike you Katherine, my talks do not overtly advertise my stutter. Your talks do because you’re talking about your OUT WITH IT book. As stutterers, we know stuttering happens as a result of trying not to stutter so I’ve found it very helpful to mention my stutter at the start of every presentation I give. Not only does this disarm the audience, it also allows me, the stutterer, the freedom to stutter without shame. 2. I am in control. Out in the wild of impromptu conversations, there are many unexpected pitfalls that can prompt stuttering. I’ve come to learn delivering a presentation on-stage is most times a planned conversation. It’s a situation where I, the stutterer, am in control. I have the microphone. I have the floor. Being in control of the speaking situation frees me from the fear of the unknown. The unknown can cause me to not feel comfortable and thus, stutter more. 3. The audience wants me to succeed. 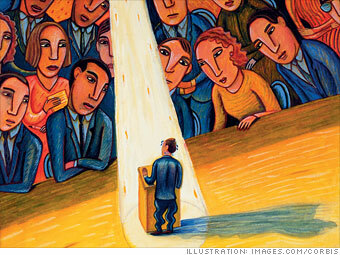 When giving a presentation on-stage, the audience isn’t there to heckle me or laugh at me. The audience wants me to succeed. The graciousness of the audience is something I’ve learned to understand and that helps me be more fluent on-stage.